Smoothies are great! You get the nutrients you need for a healthy lifestyle, but you need to blend the right ingredients in right ratio. Even some combining mistakes can make you miss out on the benefits you could be getting from them. A good smoothie is a thick blended beverage with shake like consistency. It’s generally made from fresh, healthy ingredients, including vegetables, fruits, seeds as well as some liquid such as fruit juice, vegetable juice, milk, or even yogurt. What Is Smoothie vs. Shake? Generally, a shake contains ice cream or large amounts of added sugar in the form of honey, chocolate syrup, or other additives. A beverage resulting from addition of ice cream and particularly large amounts of processed sugar qualify the resulting beverage as being a shake, rather than a smoothie. Traditionally, a typical smoothie doesn’t have added dairy or sugars, and consist mainly of “natural” non-processed ingredients. What Is Difference Between A Smoothie And A Juice? A typical smoothie is made of “mixed” or “blended” whole fruits and vegetables. So, you need a blender to make a smoothie. A juice is made by extracting only the liquid of a fruit or vegetable. On the other hand a smoothie is generally made of fruit or vegetable in its entirety. Thus, a smoothie provides extra health benefits of the roughage, skin, seeds, and other parts left out by juicing. Hence, whereas a smoothie has all the original fiber from the fruits and vegetables, a juice contains only the extracted liquid. I have seen that the people make so many mistakes while preparing smoothie. These mistakes result into turning a smoothie into a beverage far from a healthy one and at times even into a calorie-bomb. You can make a fresh green smoothie, which can be extremely healthy. But for that you need to use the right ingredients in the right proportions. A green smoothie is a thick blended beverage made of fresh fruits and dark, leafy greens like spinach, kale, chard, collards, and even dandelion greens. These smoothies are typically dairy-free, using creamy fruits like bananas, mangoes or papayas to provide a smooth texture. We all know sugar is not a good thing for human body. A fasting sugar level between100 to 110 is considered pre-diabetes. Most of the fruits have very high fructose content, i.e. the sugar within fruits. Thus, whereas fruit is good for you but relatively only in small amounts. So, avoid adding too much fruit to your smoothie. Also, sugar is full of calories. If you add too much of fruit into your smoothie, you would be creating a calorific bomb that can lead to excessive weight gain and you are likely to become obese. So, you need to be careful about eating too many simple carbs, including fruit. Bottom line is that tossing too much fruit into the blender is one of the 4 biggest smoothie mistakes. Not adding enough of the right kind of fat is another most common smoothie mistake. Adding some good fat to your smoothie helps ward off blood sugar spikes. Fat, as a general rule, creates more of sustained energy than carbs. Carbs provide quick energy, which does peak-then-crash. Coconut oil: This source of good fat is known as an appetite suppressant, an incredible energy booster and has antibacterial properties as well. Add 1 to 2 teaspoons to your smoothie for a flavor and good healthy fat boost. Protein is essential for your health. However, excessive protein can actually be worse than even eating too many carbs. Adding a lot of dairy into your smoothie is also among the most common smoothie mistakes. You don’t necessarily have to add dairy in your green smoothie. You can get enough quality calcium and protein from plant-based ingredients. As someone who workout for more than half an hour each day, I used to have whey protein every day. But, lately I have realized that the macronutrients I receive from plants are a better option. So now I don’t add whey powder to my smoothies and – speaking personally – I feel (and look) better as a result. Thus, unless you are a dedicated serious athlete, consider allowing plants to do the work in your smoothie – no animal products needed. Seeds and nuts contain on average 4 to 8 grams of protein per quarter cup. Here are some best sources of quality protein that deserve special mention for their exceptional protein value. Make sure to add the correct food as per your needs. These protein-source foods have widely varying nutrient levels. (i) Using the same ingredients for preparing smoothie all the time is among the biggest smoothie mistakes. (ii) It’s helpful to keep switching the ingredients so as to create a broad nutrient profile with your smoothies. (iii) If you keep putting the same ingredients into your blender every time, then – nutrient wise – your highs will get higher and your lows will get lower. (iv) Most of the ingredients are good for your health when used intermittently, but potentially poisonous if used relentlessly. (a) Men over 40 can get over-doze of iron if they overdo it for too long on the spinach. It can lead to serious health issues. (b) Also, selenium from Brazil nuts is very healthy, unless we have too much. Spices add the flavor into life! They are not only flavorful but most of them contain antioxidants and anti-inflammatory properties as well. I personally prefer turmeric, ginger, blue-green algae, and sometime cayenne for making green smoothies. You can opt for coconut flour, full-fat unsweetened coconut milk, shredded coconut – any of these can taste great in making a yummy smoothie. Exotic superfoods can fill your smoothie with tremendous nutrition. Foods such as goji berries, maca, mangosteen, tree mushroom powder, shilajit, and mesquite can infuse a welcomed trait to the flavor of your smoothie, while providing a vitalizing boost to your body. Results may vary. Ask your dietician first. My personal choice includes raw sprouted pumpkin, chia, and flax. As a source of protein, seeds are exceptional. Often, the nuts I toss into the blender are Brazil nuts, almonds, or pecans. Brazil nuts are naturally high in selenium (so high in fact that only 1 or 2 per person are probably enough, and moreover you don’t need them every time). I do love freshly squeezed lemon and limejuice for all its goodness! If I had to go to a deserted island and could only take a few foods with me, lemons or limes would definitely be among the foods on my short list. Lemon and lime juice give smoothies that perfect thing, called zing! And for this, you just need to add only a very small amount. The best thing about smoothies (and the virtue of owning a quality blender) is that it enables you to sneak in those extra nutritious servings of vegetables into your daily diet. My favorite vegetables to create green smoothies include broccoli, cucumber, celery, and some times red bell pepper. At times people ask me for a healthy way to gain weight. If you happen to be one of those rare people who want to add more lean mass onto their frame, avocado is a great choice. Avocado not only adds healthy fat, but also provides a richer texture to smoothies. These vegetables are so nutritious and thus great ingredients for green smoothies that they deserve a special mention. My personal choice is kale, chard, spinach and parsley. I often toss cilantro into blender, too. When I was first introduced to the smoothie world, I used to toss in lots of fruits such as frozen banana, mango chunks into blender. Gradually, I moved onto adding less and less sweet fruits. Now my taste buds have evolved, and I find I don’t need as much sweets in my diet. Presently, I mostly stick to a little fresh limejuice. But once in a while I throw in berries instead for their beneficial antioxidants. 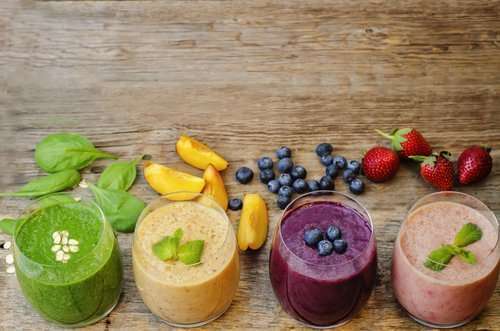 Now that you have learnt the most common smoothie mistakes, you can chalk out a well-thought strategy as per your specific needs – whether becoming fitter and leaner, losing or gaining weight. With each passing year, you will look and feel better physically and emotionally as you age.